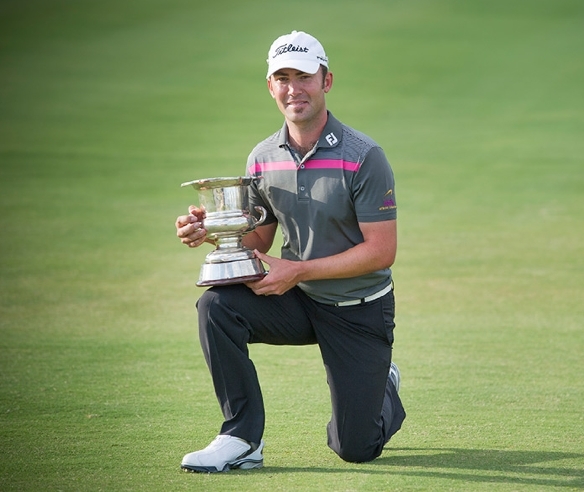 Victorian Anthony Brown has won the 2014 Mazda NSW Open after a two-hole playoff at Stonecutters Ridge Golf Club. Starting the day three shots off the lead, Brown went quietly about his business to shoot 3-under 69 and tie New Zealand’s Josh Geary at 14-under 274 at the end of regulation play. After 15 holes Brown had caught overnight co-leaders Geary and James Nitties at 14-under the card however a bogey on the par-3 16th saw him drop out off the pace. Heading to the 18th hole, now two shots off the lead, Brown made a clutch birdie to be in the clubhouse at 14-under the card. He watched on as Nitties made bogey on 16 and then Geary on 17, he briefly held the outright lead, but a birdie on 18 from Geary saw them headed to a playoff. The 18th hole was played sudden-death with both players making birdie on their first trip down the stretch. The second time down 18, Brown made birdie to claim his first title on the PGA Tour of Australasia. “It was a pretty tough week, it was stinking hot Friday then today with this wind I am just relieved to be done,” said Brown. The final round was played today in 60km/h wind gusts but Brown’s game plan paid dividends. “I knew if the wind came up it wouldn’t take an unbelievable round, it would just take a good solid round,” added Brown. Brown’s Mazda NSW Open campaign got off to a good start when he aced the par-3 6th in the first round but it was the finish that was the real highlight. “It was a great thrill to have two hole-in-ones in three events, it was pretty special,” added Brown who also had one at the ISPS HANDA Perth International. New Zealand’s Josh Geary finished second while his overnight co-leader James Nitties finished third on 13-under 275. US Amateur champion Gunn Yang finished fourth on 12-under the card and leading amateur for the week. Rounding out the top-5 was Rohan Blizard (NSW), Matthew Giles (NSW) and Michael Long (NZ) on 10-under 278. The PGA Tour of Australasia now heads to the Melbourne Sandbelt for the BetEasy Masters to be played at Metropolitan Golf Club from the 20-23 November.